Kibbutz Ma'agan Michael, Israel - BlueGreen Water Technologies Ltd.
An aquaculture earthen pond of 22,000 m2 that serves for growing tilapia- (1 meter depth) with salinity of ~12,000 µS/cm (~1-2% saline) was treated with a total of 85 kg of Lake Guard BlueTM (90% feed grade copper sulfate), with a theoretical total concentration of 3.9 ppm Cu2+. It should be noted, that the slow-release mechanism of the Lake Guard BlueTM formulation (over ~5 hours) reduces the effective concentration in the water to a fraction of the theoretical potential. Measurements taken before treatment, at 11:00 am (water temperature @ 29.5° C) indicated the existence of a variety of photosynthetic microorganisms infesting the water, including a dominant bloom of green algae with an averaged chlorophyll-a concentration of 96 µg/l; Cyanobacteria (as indicated by phycocyanin levels) with concentration levels of 2.25 µg/l; and Prymnesium sp. (“Golden Algae”) with a cell density of ~100,000 cells/ml (as counted under a microscope). A toxicity bioassay conducted with Guppies confirmed the existence of Prymnesium sp. toxins in the water despite a total prevalence of mere 1% of the entire phytoplankton population in the water. Standard treatment is usually done by 1-2 personnel and takes more than one hour. It includes walking in the water with sacks of copper sulfate laid on a floating mattress while manually applying the compound into the water. Treatment with Lake Guard BlueTM was applied on the western bank of the pond, in small mounds (Fig. 1A). The hydrophobic compound was then washed slowly onto the water-surface and carried across the pond by a western wind (Figs. 1B-C). The application process lasted ~10 min by one person working from the shore. Change in phytoplankton abundance was observed within the first 24 hours: chlorophyll-a level reduced by 65% (Fig. 2A); Cyanobacterial cell mass reduced by 53% (Fig. 2B); and Prymnesium sp. levels dropped by ~90% (see Fig. 2C). The toxicity bioassay for Prymnesium sp. turned out negative (i.e. no toxins). In line with past experience, masses of dead phytoplankton cells (Fig. 3) could be seen floating on the water surface the day after the treatment (none was observed before treatment). The treatment had no adverse impact on fish or any other non-target organisms in the water during or after the treatment. The copper mounds fully disintegrated within the first 24 hours. A very small amount of Lake Guard BlueTM particles remained visible on the water surface for a few more hours before completely dissolving. Total free copper concentrations measured at 24 hours post-treatment was 0.15 ppm – effectively returning to their pre-treatment levels of 0.11 ppm. While dissolved oxygen reduced by 42% due to the reduction in photosynthetic activity, the pH levels remained almost unchanged (reduced from pH 8.57 to pH 8.27) probably due to the high buffer capacity of the water. This buffer capacity, as well as water hardness, also explain the higher-than-average dose of copper needed. Fig. 1. 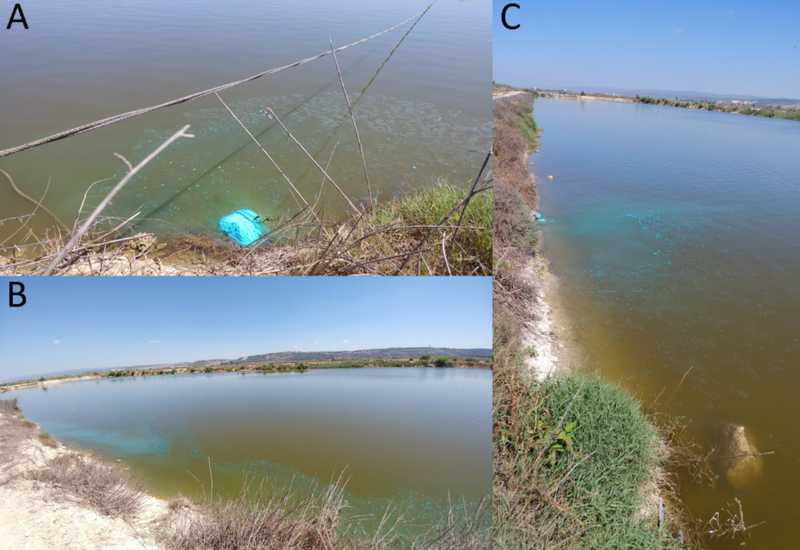 Pictures of (A) Lake Guard BlueTM mounded on the western bank of the earthen fish pond; (B-C) Water currents carry the hydrophobic particles across the water surface. Fig. 2. Change of the averaged chlorophyll-a (as a proxy for the total photosynthetic microorganisms inhabited the water). Fig. 3. Floating dead phytoplankton cells could be observed accumulating on the eastern bank of the pond 24 hours post-treatment.